Game online at AetherCon II! Hello, gamers! Have you ever attended an online gaming convention? If not, you should consider logging in to Aetheron II this weekend, November 15-17th! This is AetherCon's second year of running an excellent and free online gaming convention, and they have loads of events, games, and panels. I had the opportunity to catch up with Barry Lewis, the Promotional Coordinator for AetherCon. He was able to answer some questions about the convention! Growing Up Gamers: This is AetherCon's second year. What was the original idea behind AetherCon? Has that changed since sine last year? Barry Lewis of AetherCon II: The main idea is just to get people together to play RPGs and have fun with a sense of community behind it. That has not changed and never will. Growing Up Gamers: What are the technologies that you are using? What can simulate the in-person roleplaying experience? Barry Lewis: AetherCon is using free, web based programs to run the convention. The two programs we’ll be using for the RPGs is the Roll20 program, which will be the main program being used, and the INFRNO program, in which a few games will be featured on. Roll20 and INFRNO will be used for the publisher demos as well. The other program we'll be using is Anymeeting, which is a free web conferencing software, for the Q&As, panels, vendor hall and artist enclave. I think the two programs, Roll20 and INFRNO, come very close to the “in-person” feel with their use of webcams/chat rooms and on-screen graphics. The only thing you can’t do is raid the GM’s fridge for snacks! Growing Up Gamers: How many people do you expect to attend AetherCon II, and how many took part last year? Barry Lewis: As of right now I don’t have the solid numbers, since they tend to fluctuate, but this AetherCon is shaping up to have more people than last year’s event. We’re learning little by little what works and what doesn’t and this will help us improve each year and this translates into a better experience and more attendees. Growing Up Gamers: How have game designers and other panelists responded to the idea of an online convention? Your schedule certainly shows us that there has been a great response, but have others been hesitant? Barry Lewis: The response has been excellent. Since this is a fairly new(ish) idea they are intrigued with the concept and would like to see it succeed since it’s another way to get their products and themselves more exposure. They’re only hesitant until they check their schedules to see if they are available. If they’re available they tend to jump on board quickly. Growing Up Gamers: Since AetherCon last year, I have seen at least one other online game con (ConTessa). Do you think more conventions of this sort are going to take off? Barry Lewis: I’m noticing that online conventions are starting to appear. VirtuaCon just happened in October so I’m sure we’ll see more in the near future. Growing Up Gamers: I imagine it is taking a lot of work from a lot of people to make this happen. How many people are on your team? Barry Lewis: I’m the director of a “live” game convention and I think doing a “virtual” game convention is much harder. AetherCon has staff spread out across two countries, US and Canada, and it’s a lot of emails, messaging and live chats. You definitely have to be well organized and prepared for anything. We have around 12 people working for AetherCon at any given moment with 8 or 9 of them being senior staff. Growing Up Gamers: Are there any event types that are not yet represented in AetherCon's schedule that you would like to see in coming years? Barry Lewis: I would like to see other aspects of gaming, such as card games and miniature games being integrated into the convention, but that just opens a whole other logistical “can of worms”, at least for now. Thanks, Barry! 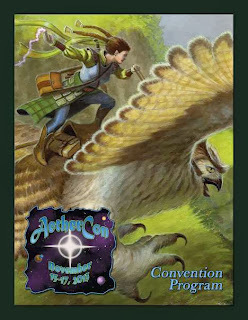 I would like to point out to our readers that I will be participating in AetherCon II as an attendee, a host for a couple panels and a panelist myself. If you would like to catch up with me (Randy of Growing Up Gamers), drop in to the panel at 3-4:20pm EST on Saturday Nov. 16th called Looking for Players: Bringing New Faces To Our Tables. I'll be on the panel with Mike Mason from Chaosium and Mark Diaz Truman of Magpie Games. Additionally, on Sunday I will be hosting Q&A sessions with Brian Berg of Total Party Kill Games at 4-5pm EST and Todd Crapper of Broken Ruler Games at 5-6pm EST. I hope to see you all there! If you've ever played any tabletop wargame at all, you know that they're expensive. Very expensive. You need rulebooks, paints, brushes... and models. Lots of models. It seems like you can never have enough models to do everything you want. I'm personally more of a roleplayer, and am more interested in having a wide variety of models to represent the players in the Iron Kingdoms RPG, and the variety of creatures and characters they will encounter. Yes... expensive. What I'm hoping to do here is to give a brief guide to playing Warmachine, Hordes or the Iron Kingdoms Roleplaying Game on a budget. This is what will interest most Warmachine/Hordes players will be most interested in. How do you build a faction army cheap? The simple answer is that you can't. Sorry. This isn't a magic bullet. The more complex answer is that with certain factions, you may be able to stretch your money a little further. Here's how! Every faction has a starter box. This is a fully playable battlegroup, complete with a Warcaster or Warlock and some Warjacks or Warbeasts. These MSRP for $50, and are a great deal if you price the pieces out individually. In most cases, you'll want to start here. The downside is that you might not want that particular caster, but having a variety to choose from will be worthwhile in the future. 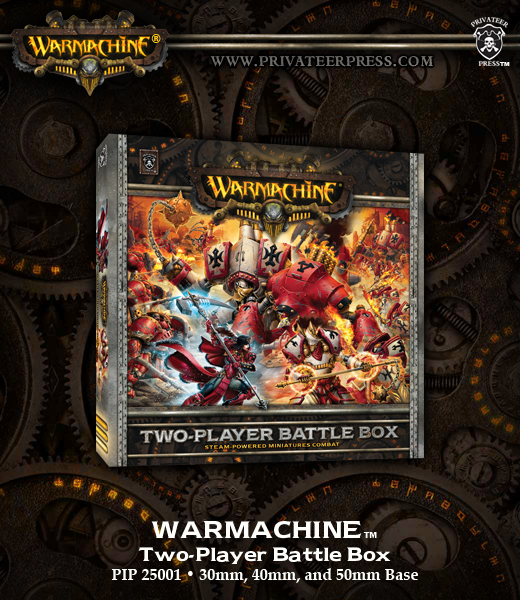 Both Warmachine and Hordes have a Two Player Battle Box. For an MSRP of $99, you get two starter kits, plus an additional sizable unit for each faction. This is an insanely good deal... especially if you can pick it up at a discount (a search while I was writing this turned up deals from $61-$75). This will limit you to one or the other faction (Khador & Protectorate of Menoth for Warmachine, Circle Orboros o& Legion of Everblight for Hordes). The upside for this is that if you and a friend want to jump in and try it out and are willing to use those factions, this is perhaps on of the best deals around. I personally picked up the Warmachine box, and I was glad to fill out my Protectorate & Khador factions. So many models! As a bonus, they also come with quickstart rules. 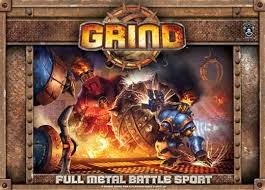 Privateer Press released a nifty boardgame a few years back called Grind. It was based on a Warmachine game that was printed in No Quarter magazine. I would love to say that I played this game; I really would. But I didn't. What I really liked about this game was the value. What I found is that the contents of this box, plus one Cygnar Heavy Warjack kit (the Ironclad/Cyclone/Defender one) and one Khador Heavy Warjack kit (the Destroyer/Juggernaut/Marauder/Decimator one) and you can put together six heavy warjacks: 3 Cygnar, 3 Khador. That's value. And that's not even taking the light models into account (just for Cygnar; Khador doesn't do light warjacks). The Cygnaran 'jacks are spot-on with only the tiniest bit of conversion necessary. The Khadoran ones have ever-so-slightly smaller smokestacks, but that's barely noticeable. Totally worth the price. I'll bet the game is probably good, too. Side by side, warjacks from the kit (left, Defender) and from The Grind (right, Cyclone). Inevitably, you're going to want to try out a model that you don't have. You're considering adding one to an army list, and you think it's synergize with others, but you want to make sure. Use another model as a stand-in! This is called proxying, and it is perfectly fine for friendly (read: non-tournament) games, as long as you're up front with your opponent. If you're a roleplayer, you probably already do this. It makes far more sense to say the Defender (a Cygnaran heavy 'jack) is a stand-in for an Avenger (a spiffy new Cygnar heavy) that you want to check out. Just make sure that when you proxy a model, you use another with the same size base, and preferably one similar so you and your opponent can easily track the board state. It's worth noting that you won't be able to do this in tournaments or at events, where you'll need the actual model and the stat card to field a particular model. The foamboard sticks in the foreground are proxied Wracks. One way to get more mileage out of one of the plastic heavy warjack kits is with magnets. The kits have all the parts you need to build three or four different jacks out of the same kit, and you can use rare earth magnets glued in to swap out heads, arms and weapons. So that kit will still only be one warjack, but you can swap out which type it is. Nifty, huh? (Thanks again to greibach for this!) Update! I just showed how I magnetized a Cygnar Avenger-Centurion-Hammersmith kit! 1. Khador: With the Two Player Battle Box and Grind, Khador is probably the cheapest to build up an army. Going by MSRP, the Battle Box is roughly equivalent to the MSRP of the Khador models and gives you an extra faction, either for you or a friend. You can angle in a bit cheaper with the Start Box plus the Man-O-War unit, but extra models are always nice and may be worth having to trade. 2. 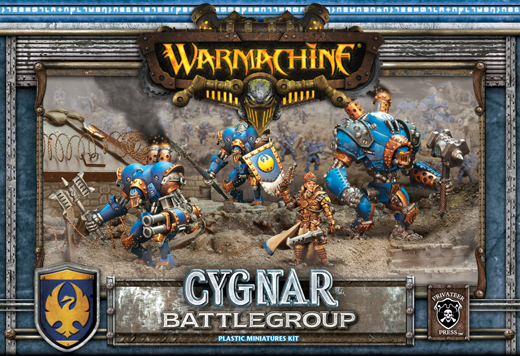 Cygnar: No Battle Box support for Cygnar, but you can fill out your heavy 'jacks with extras from Grind. 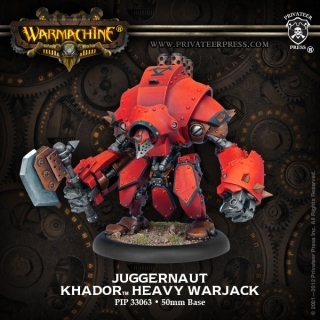 As I said above, one Heavy Warjack kit plus the two extras from that game will give you three Cygnaran heavies (one each Defender, Ironclad and Cyclone). I recall a slight modification to an upper arm joint, and clipping the hand off one forearm and replacing with one oriented for the correct arm, but that is very minimal. I have not yet tried to do anything with the light 'jacks other than proxies. When I have any amount of disposable income, I may do an order from the Privateer Press Parts Store and get some pieces to convert them into other Cygnaran light 'jacks. 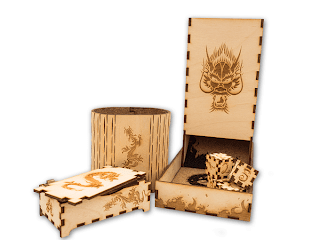 3.Protectorate of Menoth: Again, the Two Player Battle Box is a great starting point for Protectorate players. Two heavy warjacks, one light one, Kreoss and a unit of Exemplar Cinerators. The Starter Box for the Protectorate has Kreoss, two light 'jacks and a heavy. 4. Circle Orboros & Legion of Everblight: These factions are in the Hordes Battle Box, and their lists look like a comparable deal to the Protectorate, above. 5. 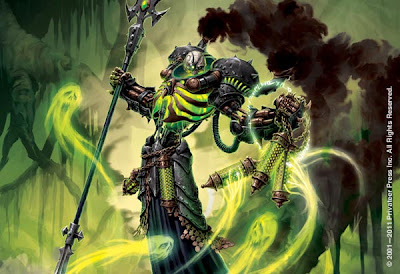 Other factions (Cryx, Retribution of Scyrah, Skorne, Trollbloods, Mercenaries, Minions, Convergence of Cyriss): Other than the starter boxes, no great deals like above. It's a shame, since these factions all have some impressive models. I think I could field a pretty high point cost Cryx force; they make excellent RPG baddies! Note: This list above is not necessarily factoring in competitive play, but mostly looking at getting the most models on the table. There is a discussion on Reddit about this that goes more into what factions are the cheapest in terms of fielding a competitive army. My list above should be considered in terms of getting faction models on the table for Iron Kingdoms roleplaying. I hope that helps you if you're looking into building an army on the cheap. It's true that wargames are a big drain on the wallet, but some planning can certainly help things along. The next installment will focus on painting. Do you have any moneysaving tips for Warmachine, Horders or the IKRPG? Post them below! Hello, all! I think it would be an understatement to say that the Growing Up Gamers crew was on a big Privateer Press kick lately. The Warmachine Tactics Kickstarter really got us going, and speaking to Matt Wilson also really got us excited. This is not a new thing, however. I have personally been a fan of the Iron Kingdoms from very early on, and had a years-long roleplaying campaign based there. This article, however, focuses on the miniatures. 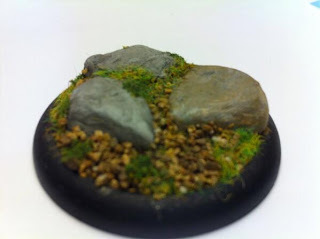 Elf warcaster Kaelyssa, on a custom Cygnar ruins base. I have been painting minis on and off for about twelve years, not counting a handful that I mangled in high school. Rather than a veteran, I would classify myself as an "advanced beginner". What does that mean? I can paint models, and they usually look pretty good. I can make pretty nice bases, do fun conversions... but when it all comes down to it, I don't have a lot of time to invest in it. So I try to get a lot of mileage out of the techniques I do know. 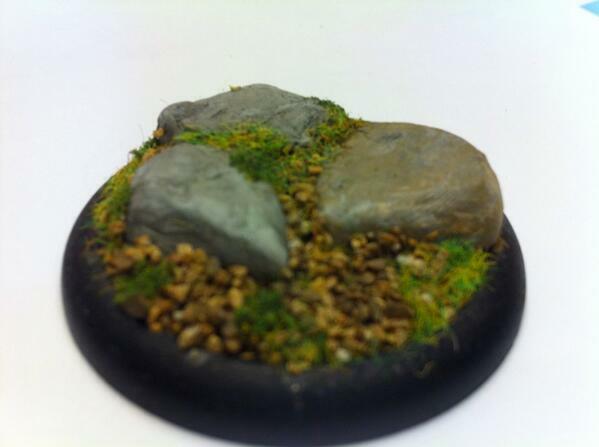 Scenic base, probably for a warjack. One thing I love is what is called converting miniatures. Basically, this is taking a miniature and altering it. It can be as simple as a repose or a swap of a weapon or head from another mini. Or it can be a more drastic thing where you take a bunch of parts from different minis and/or made from epoxy putty and making something altogether different. It helps to have a well-stocked bits box. Work in progress: Mage Hunter Eiryss on fallen tree base. Master Necrotech Mortenebra, iron lich and crafter of Cryx's legions of Helljacks! For the record, this is an alternate version of the Cryx warcaster Mortenebra that I started quite a while back, before she was released as a mini. Since then, she has gotten her own mini, and I picked up the upper torso from the stock mini to use. The parts are from eight different models from Wyrd Miniatures and Privateer Press, with some parts built from sheet styrene, putty epoxy, paperclips, some old guitar strings and a brass rod. I'll put up more pics when I paint her up. So... anyone else into miniatures? What are some of your favorite? Any miniature modeling topics you'd like to see here? Let me know! Gen Con this year was an amazing experience. Due to a mix up in communication it ended up being a last minute decision for us to go to Gen Con. Only through the generous help of a family member and the power of social media were we able to afford the trip and find a place to stay at the last minute that was only a few blocks for the convention center. We were rushed, we flustered, and we were very nervous, but we couldn't be happier about how it all turned out. When our plane first landed in Indy, we were happy, nervous, and a little...crazy? We spent most of the convention with Storm Hollow. When we weren’t running officially ticketed games of it, we were arranging and running pick-up games with anyone that could clear some time in their schedule that lined up with ours. We also spent some time meet with our publisher, Game Salute, about the game and talking with other game designers about our game. I’ll talk about how our games of Storm Hollow went in a bit, but first I’d like to mention some of the incredible people we met and the cool games we got to play. Before Gen Con even started, we got to briefly say hi to Wil Wheaton when we saw him dining at the same restaurant we were at. It was a polite and quick hello as we didn’t want to bother him while he was trying to get some grub, but as he left Angie was able to give him his very first die of the convention and he paused a moment to tell us about the great book he was reading. Wil was an incredibly nice guy and it was fun to get even a few moments to say hello. In what feels to us like a bizarre twist of fate, we got to be on the other end of that exchange when we were stopped randomly while walking through the exhibit hall by someone who recognized us and wanted to take our picture. It was humbling and funny and weird and awesome all at the same time. 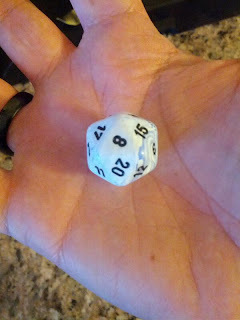 We couldn't get a picture with Wil, but he later tweeted a picture of his hand holding Angie's d20. During our first game of Storm Hollow where we got to meet a couple of incredible guys from England whose wives sent them each to Gen Con as their 40th birthday presents, Scott from The Board Game Show podcast, and his friends Al and Heidi. Talking to Heidi about her recent project was very inspiring. She had created an awesome tarot card deck called Psychonautica. It has beautiful, hand-drawn figures on every card. The figures were drawn off of models of many different body types and broke with traditional roles in subtle yet powerful ways. The figures are created with simple, graceful lines without any shading or color and set against a vivid color background texture. The effect is that Heidi manages to make each and every body type seem graceful, beautiful, and relatable. On top of that, the tarot deck comes with rules for playing it like a trick taking card game. We didn’t get a chance to play it, but reading through the rules it reminded me of the game Oh Hell (one of my favorite trick taking card games) with some fun flourishes and differences added in. Psychonautica is available through The Gamecrafter and is absolutely worth checking out. We got to meet Cole Medeiros, a fellow game designer who was out playtesting and pitching his space game called Starship Captains. It reminded me a lot of a game we tried to develop awhile back. We struggled to find a way to rope in all the ideas we had about running cargo across the galaxy, upgrading your ship with tech, hiring crew members, and going on dangerous missions in a way that held together as one game and wasn’t overly complex. I got to play half a game of Starship Captains and Cole has done a fantastic job of putting all those elements into a fine mix that plays pretty fast and isn’t overly complicated at all. We loved what he has going on in that game. When last we heard, it sounded like Cole had a few publishers interested. We are definitely rooting for his success. Playing Emperor's New Clothes. Its not camera glare. Those game components really are all blank and white. We got to see our friend Jonathan Liu, a writer for the Geek Dad blog, several times at the convention and I got my first opportunity to play his game based on the Emperor’s New Clothes. It’s a game where each turn you roll three absolutely blank dice (you are allowed to reroll twice to get different results), then collect an amount of dignity, gold, or gullibility based on that roll (resources represented by blank white cubes), play blank white cards to help yourself or hurt other players and then reveal role cards to show how well you scored for the round (cards which are also entirely blank and white). You then mark your score for the round by moving your blank white score ship across a number of spaces across the scoreboard equal to the points you scored that round. The scoreboard is also blank, white, and has no numbers or spaces on it at all. Yes, all the components for the game are blank. Angie and Randy had played the game before, but I had only heard of the concept. I thought the idea was just to play a joke. You sit down and pretend to play a game with blank cards, pretend to take it seriously, and laugh at the confused onlookers who are trying to deduce what you are up to. The truth is that the game rules Jonathan has devised provide enough structure to make an intriguing game of imagination and live game design that you can really absorbed into to. You find yourself trying to decide which role you should reveal based on what role other players have claimed to reveal. You base your imaginary cards off of what you think will be funny and stick within the parameters of what really feels like a game. You really can’t see how much of a game really is there until you sit down to play it. I don’t think the game is being sold outside of its now closed Kickstarter project, but the rules are available on the Kickstarter page…and you can probably find your own blank stuff to play with. Although the art on the official blank white cards really is fantastic. We ran into several friends we were excited to see. We got to play some games of Commander style Magic the Gathering with Erin Campbell of the Deck Tease podcast. We met her at Gen Con the previous year and it was fun to hang out, play Magic, and catch up. We had the incredible honor to interview Matt Wilson, owner of Privateer Press and the man who created the Iron Kingdoms, Warmachine, and Hordes. It was an amazing experience that will get its own post in the near future. Angie got to play a fantastic game called Dungeon Roll with our new friends Andy and Andy (the fun English guys who were there on their birthday trip). This game comes in a little dice game comes with many custom dice and tokens all packaged in a small, cardboard treasure chest. The game plays quick, lets you feel like you are gaining loot and leveling up, and actually uses the treasure chest to let you gain treasure all for the fantastic price of $15. Andy and Andy and Angie (behind the camera) playing Dungeon Roll. We both got to go out to dinner with Dennis, a guy who has supported our game since we met him last year and even ran one of our sessions at Gen Con (more on that in a bit), and with an excited backer named David who related some incredible stories about games of Storm Hollow he’d ran off the Kickstarter materials. Dennis was incredibly kind and generous. David really inspired us with his enthusiasm and joy for Storm Hollow. Julian, Angie, Dennis, and David having a nice break from the roar of the convention center. While we did find some opportunity to check out other games, most of our convention was spent in the service of Storm Hollow. The games of Storm Hollow that we played were amazing. Getting to meet some of our backers was an honor we will never forget. Your belief in Storm Hollow, your feedback, and your kind words were all incredibly inspiring and energizing for us. Of course, the players at Gen Con weren’t just backers. There were also people that had heard about it from friends, seen it online, or just came across it on the Gen Con Schedule and thought it sounded cool. I had the brilliant idea that I would write careful notes after each session to be able to compare and contrast the different approaches each group took. I did this once, then lost my notepad, found my notepad on the evening of the last day of the con, made some more notes from memory, and then promptly lost the notepad again by leaving it on the plane home. Soo… oops. Fortunately, because I did make notes and because the games were so much fun, I do remember many of the details of what happened. There were too many awesome moments to recall them all here, but here are a few highlights from the games. The demo adventure we ran is called The Wondercart Speedway Expo. It was an adventure we’d run a few times before but we modified it so that it was now a race through five districts of the city of Venture. The heroes get to build and race a wondercart (steampunk racecar that the entire team of heroes will fit inside) with the help of their new friend and ally Hasty Hastings, a Stumbletoe engineer that works for the Grumbok Engineering Corps (they do employ a few non-Grumboks). The race is an opportunity for the GEC engineers to show off their best gadgets and Hasty has a soda cannon that fires pink fizzy soda that he wants to show off. During the building portion of the adventure, the heroes choose a body, an engine, wheel-type, and gadgets for the cart. Then they choose how they want to paint it and what they want to name it. After the wondercart is built, the heroes race it through the city and face off mainly against one other racer, a mean Grumbok who has built a tank-like wondercart with a lightning gun turret on top and tubes coming out the side the fire goo. Each turn of the race ran through a different district starting in the Diamond Arena and going through the Brassworks, Silverwall, The Weave, Crystalcade and finally back through Diamondhold to return to the arena. Heroes were free to pick their route through each district or even dive into minecart rails beneath the city to see if they could pop out someplace useful. Players had fun creating their carts! Our various heroes had great variety in the wondercarts they built with fun names like Beesed Lightning (a car with a modified soda cannon that could also shoot bees), the Thunderbooster Mark IV (Thunderbooster being the first cool sounding word to hit the brain of a young boy and Mark IV being the very important addition of his slightly older sister who seemed to feel Thunderboost was too silly and needed something extra), and the Fizzy Wizard (named for the little wizard puppet automaton the group built to stick on top of the car to keep a look out for danger). Each wondercart had its own unique paint job. Many had lightning or flames painted on the side, one was pink and soda pop themed, one painted to magically camouflage itself to the surrounding city and one had lightning that could strobe between different colors on command. During the building scene, many heroes checked out the competition, but one hero even snuck a chug (in this case a tiny brass ball that sprouted little legs and arms) aboard the bad guy’s car to sabotage it during the race. The heroes came up with many different gadgets to put into their wondercarts. There were several variations on a lightning collector that would absorb blasts from the bad guy and send energy to power the engines. There was a modified soda cannon that also fired bees, a grappling hook gun, various shielding gadgets, and automated hands that dropped boom sticks. There were various nitros and boosters, hover fans and wind machines to make the wondercart float, smoke bombs, and a modified soda cannon turned into a fizzy engine that used fans to aim the soda down and create a soda-oil slick. Hasty had a few gadget plans of his own in case they were needed, but the heroes always had such an amazing amount of gadget ideas that these plans were rarely used. The wondercart fits Hasty and a team of six heroes ready to race. As you can tell, The Wondercart Speedway Expo when compared to rescuing Twilla from being kidnapped in the Den of Darkness is…well, a bit silly. Well during the race things got even sillier and more awesome. The different groups of heroes each tackled the race with their own sense of style and panache. One group of heroes created a slightly titled ramp with earth magic, attached a sail to the top of the car and used wind magic to jump over a section of the city while doing a barrel roll while the Whizbanger threw the Stormchaser out the window so that the Storm Chaser could grab the bad guys cart with his Thunderlash (lightning whip) and climb aboard to cause more mayhem. Surprisingly, there were several incidents where heroes felt inspired to leap out of their own car to land on the enemy vehicle. In another instance, two heroes leapt over together. One of them used the Thunderlash to whip tools out of the Grumbok teams’ hands and the other set to work sabotaging the lightning gun. One flashy hero visited the enemy cart only briefly as he leapt out to drop boom sticks on the dark tank and then rode an arc of lightning back to his wondercart. The previously mentioned bee cannon was fired at time when a giant fluffy pillow was being thrown at dark tank to block some of the goo being fired (the hero was trying to grab something more useful out of his pack but a pillow is what he got). The effect was that the dark tank became tarred, feathered, and covered with bees as the goo was knocked back by a cloud of pillow feathers and buzzing bees fired out at high velocity. Most people fired the soda cannon to good effect at least once, but one young hero was in love with firing the soda cannon and spent the entire race shooting soda at the bad guys face, into his lap, and all over his team of Grumbok engineers. This finished with a final blast where the Sparkcaller stabbed the stream with his Fang of Winter and froze the Grumbok bad guys in solid, icy soda. Other heroes threw a rubber mat over the lightning gun, bent the pipes of the goo gun, created a small storm over the dark tank, used shields to block or reflect lightning back to the enemy cart, and threw out a blinking detour sign to throw it off course. There were many amusing antics and fun strategies employed to mess with the dark tank. Once the race was run, the people of Venture cheered for the amazing race run by the Poppin heroes. All the heroes were treated to a nice meal, good drinks, and often chocolate and sweets back at the Winddown clubhouse in the Brassworks. Amazingly, at the end of a full day building, racings, and celebrating, when they left the Winddown they all managed to exit back out into a game convention in time to get to their next scheduled event. The games were amazing and we couldn’t have been happier with creative ideas and the fun interactions we got to watch unfold each time we ran the adventure. Thank you to everyone who played. We hope we helped make your Gen Con experience memorable because you made our Gen Con absolutely unforgettable. 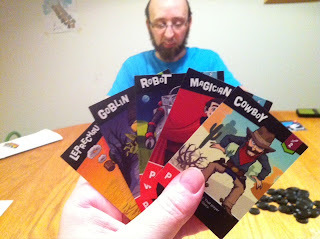 Our friend Dennis runs his first game from a few notes and a quick crash course on how to play. As a final note, we’d like to give a big thank you to our friend Dennis who was so eager to run a game that he did so with only a short crash course on the rules and the adventure which he ran off of my explanation and a minimal amount of notes (we didn’t have time to get the adventure in a full presentational format so that it could be easily handed off). He dove right in and had to run a six person game in a noisy convention center. Anytime you’ve got a full load of six heroes (especially people who don’t know each other) it can take a lot of tap dancing to keep things moving along, make sure everyone feels included, gets to throw out their own ideas, and has a fun time. He ran a fantastic adventure, with his own take on the story, and everyone seemed to have a great time. It was a real treat to get to just sit and watch someone else run the adventure for a change. We’d also like to thank all of our backers who shared stories of games they’d ran during previous playtests or off the Kickstarter materials. Those stories were wonderful and we truly can’t express how much it means to us to hear detailed accounts of where people had fun, where they got mixed up, and what decisions storytellers made to accommodate the ideas of their heroes. Thank you again to everyone that helped us out, shared their experiences with us, and made Gen Con 2013 an event we will always hold dear in our hearts. Hello there! You guys know how we love Kickstarter, right? Well, we've have the opportunity to try out a couple games on Kickstarter right now. Ready for some recommendations? Let's kick it off! The Growing Up Gamers crew love games that teach something. 'Educational Games' have been around for a while, in one form or another. In my experience, though, most that fall into this category only educate or entertain, but not both. Tim Handley's Fire and Flora did both for us: it delivered interesting play, and we learned a bit about fire ecology. Nifty, huh? Overall, the game is pretty simple: you try to acquire lands and plant native species, and earn victory points for doing so. Land is purchased with coins, and often has a plant species on it. Native species give you victory points, and invasive species fill your lands, invade and drive out native species. 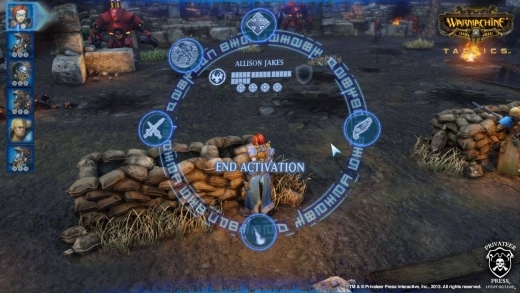 You can grow, propogate or kill species with the four resources: Fire, Water, Time and Labor. Each species has a personality that defines how they react to each resource. You may also play resources on your opponents' plants. There are also event cards, and most of these are wildfires. The brilliance of the game is that it shows the effects of fires and invasive species on the environment. The designer is a [wildlife biologist? ], though, and notes that some species actually propogate due to fire. This, coupled with beatiful pictures of plants make this a great teaching tool for discussing plant invasion and wildfire, as well as an interactive building game that is fun and combines simple strategy with risk management. Much like the title implies, IncrediBrawl is a fighting game. The designers sent us a copy to try out, and we enjoyed it. Our daughter in particular liked it. Each player has a deck of characters, and each character has an attack type (Physical, Energy or Primal) and a level. Each player secretly chooses a character, and then reveals simultaneously. Attack types overcome in a rock-paper-scissors fashion (Energy beats Physical, Physical beats Primal, Primal beats Energy), and if the attack type is the same, there is a level and the highest wins. That's the basic resolution system, and that is enhanced by powerup cards, and the characters themselves each have a special ability. 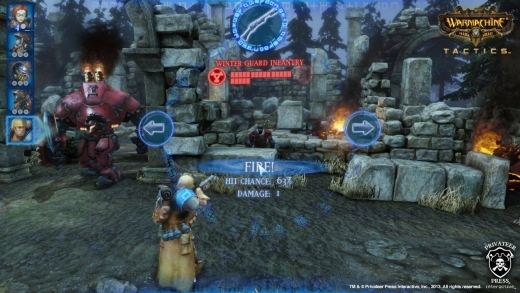 Multiplayer games have the players do two-person matches, with winners facing off. The winner is the first person to get 10 glory, which are the victory points of the game. We noticed that glory tokens exchanged hands a lot, based on character powers. Overall, a fun and light game. Warmachine: Tactics is a game we have anticipated for a while. Since Privateer Press announced teaming up with WhiteMoon Dreams a while back, I've been frothing at the mouth for this. Warmachine: Tactics is a PC/Mac version of the Warmachine tabletop miniatures game that supports both single player campaign modes and multiplayer online matches. Since the project launched on July 10th, it steamrolled through its initial goal and has been unlocking stretch goals like mad. We interviewed Matt Wilson of Privateer Press shortly before the project launched (you can read that here). If you like turn-based strategy, take a look. This should be amazing. Also note that there are some great-looking miniatures playable in the tabletop game as backer rewards. We have high hopes for this game, and we are watching the project closely. After getting a comment below, I had to check this campaign out. I don't normally add things after-the-fact, but I just loved the Daft Dice campaign. The custom dice are really nice: laser-cut wooden dice with great designs. But what are really amazing are all the accessories. Take a look at the beautiful dice towers! 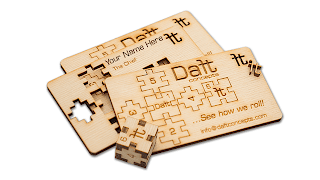 I can't even tell you how much I want a set of these business cards. Wow. Well played, Daft Concepts. Well played. Any projects you feel should have been included, or comments about the ones featured? Let us know in the comments! 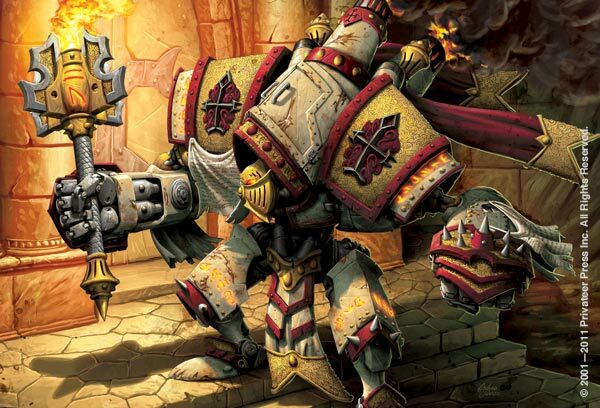 Privateer Press's Matt Wilson talks Warmachine: Tactics! Hi, readers! We have an exciting treat for you today. Matt Wilson of Privateer Press agreed to give us an interview about Warmachine: Tactics, the computer version of their amazing tabletop miniatures game. The Growing Up Gamers crew have been big fans of Western Immoren, the setting for Warmachine, its sister game Hordes and the Iron Kingdoms roleplaying for about a decade. This is a world at war, a world of steampunk-inspired fantasy where nations go to battle with great machines of war called warjacks. Controlled and directed by powerful armored spellslingers called warcasters, these steam- and magic-powered robots are the game's namesake. Matt Wilson, creative genius behind this world and founder of Privateer Press, is quite a guy. In addition to to being the game designer who brought us Warmachine, Matt is an accomplished artist whose work can be found both in Privateer Press products as well as in Magic: The Gathering; I highly recommend checking out his art site. Matt's company Privateer Press now makes tabletop miniature games (Warmachine, Hordes, and Monsterpocalypse), board games (Level 7, Grind, and the Bodgers line of games), hobby accessories (the Formula P3 line of paints, brushes, and hobby tools), and now is about to go electronic with Warmachine: Tactics. A Warmachine computer game has been anticipated for a couple years, since the announcement of a partnership with Privateer Press and WhiteMoon Dreams. Two weeks ago, it was announced that Privateer Press would be going to Kickstarter to fund development of their game. We feel that this is a great move, as it allows fans to really get behind the game and have a more direct connections with the people producing it. The project launches July 10th, and we had the opportunity to ask Matt a few questions. Check out what he had to say! Growing Up Gamers: I am so excited to play Warmachine on my computer! What can I as a player expect from this? Can I build my own warcaster? 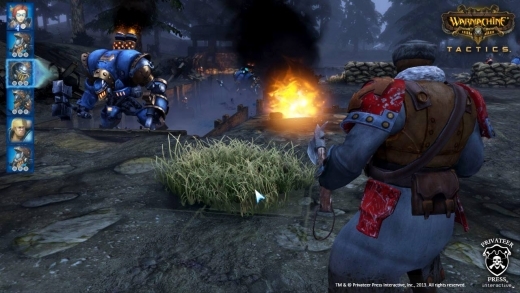 Matt Wilson: WARMACHINE: Tactics has both a multiplayer mode and a single player campaign mode. The multiplayer mode has a lot of similarity to the tabletop version, but as this is a different medium, we're taking advantage of what it can do to enhance the experience, while at the same time, eschewing that which works better on the tabletop. In the single player campaign, while you're not building your own warcaster, you are in control of the character's progression from level to level. Each campaign focuses on a single central character, the first of which we'll be revealing in our Kickstarter video. GUG: Different characters and campaigns? Awesome! How close will this adhere to the rules for the tabletop game? Have there been any challenges in translating those rules to a computer game? And is there anything your team is bringing to the digital game that couldn't be done on the tabletop? Matt: The experience will feel familiar, but it's not the same game. Conceptually, it's the same world and environment and we're adhering the the same basic mechanics on a fundamental level. But the math behind the scenes works differently. There aren't any cannon fodder soldiers that go down when they take one point of damage as sustainability is much more crucial in a game of this scale, lest balance be tipped too quickly in a match. And definitely, the medium gives us the opportunity to do things like interactive terrain, that is less viable on the tabletop. Of course, the very exciting part of this game is getting to experience it all happening in front of your eyes. We've taken a very cinematic approach to the action. Seeing Warjack power attacks happening as real-time events in the middle of a combat round is just awesome! GUG: Are there plans to port to any consoles if the Kickstarter is successful? Matt: Our focus is entirely on PC and Mac, but we are developing with other platforms in mind should the opportunity arise. The team at WhiteMoon Dreams has designed a UI that can work on virtually any platform with any control set. In other words, it works just as well with a touch screen as it does with keyboard and mouse, as it does with a standard console controller. So, if opportunities do come up in the future, we won't have to reinvent the game from scratch. GUG: The GUG crew is no stranger to Kickstarter; we (as Escapade Games) used that platform to fund our upcoming game, Storm Hollow: A Storyboard Game. Crowdfunding allows a connection between game creators and fans that traditional publishing just did not do, and we love the way it has allowed game designers to bring their products to market. The press release made it pretty clear why you chose to crowdfund Warmachine: Tactics. I would follow up and ask, why now? Matt: It took a long time for me to believe that Kickstarter was the right route for us to take in order to make this game. While Kickstarter has quickly proven to be a powerful platform for fundraising, it's still a new platform, and one that is little understood. We needed time to study it, to determine if the risks inherent in crowd sourcing are worth accepting given what we are trying to achieve, and to understand the actual business necessary to manage a successful Kickstarter project. The majority of Kickstarters fail. Of those that fund, many individuals and businesses alike find that they have not properly planned how to manage the capital that they've raised. In conducting a Kickstarter, you're making a huge promise to the people who back your project, and more than anything, we wanted to be confident that we could deliver on that promise. So, before our project will even launch, we have put a great deal of time, effort and money into developing enough of WARMACHINE: Tactics so that our potential backers can have the same confidence we do. The myth about Kickstarter is that it's a place to fund ideas. We're not Kickstarting an idea, we're Kickstarting a project that is in motion, that has proof-of-concept and a business plan, and that is being executed by an experienced team with overhead and expenses that must be maintained during this startup period prior to even launching the project on Kickstarter. Getting to this point, responsibly, took time, and I wouldn't have wanted to launch it a moment sooner. GUG: Why does Privateer Press need Kickstarter? There has been a lot of talk among fans of crowdfunding as to who belongs there, whether or not bigger players should be there, even suggesting that they might be edging out independent studios. What can you say about that and the kind of commitment it takes to delve into making a video game, and whether it would have been possible to do otherwise? Matt: For Privateer and WhiteMoon Dreams, the two practical routes to getting a WARMACHINE video game made are the traditional publisher/financier method, which entails lengthy review processes and a great deal of expense on the part of the developer in an effort to try and align the product they are trying to make with the right financing entity — which in the current video game industry environment I would liken to trying to force a planetary alignment with your own bare hands — or, crowd sourcing. For a company the size of Privateer Press, creating a brand new video game isn't analogous to creating new board game product, it's literally launching an all new business. In order to make this happen on a timeline that is within the foreseeable future and not have to nut away funds for the next ten or fifteen years, saving up enough to launch such a venture, crowd sourcing has become a viable and attractive opportunity. Kickstarter itself has released its own stand on what's appropriate for Kickstarter. The idea that 'bigger players' have a negative impact on other projects is a theory with no scientific support. Instead, Kickstarter has proven the positive impact 'big players' (or let's say popular companies and personalities) have had on the community as a whole because all the data they have shows how many first-time backers those big projects brought in, and how many of those backers went on to back other projects on Kickstarter. Whether or not Privateer is a 'big player' is somewhat in the eye of beholder. The fact is, we're totally independent, as is WhiteMoon Dreams. But Privateer does have its own community of players and I believe that many of them are going to be first-time backers on Kickstarter with this project, which means we'll also be helping the Kickstarter community grow by conducting our project there and exposing new people to the platform and all the projects going on there. GUG: We are big fans of Magic: The Gathering, a game you are certainly familiar with, given your illustrations can be found on a number of cards for that game. A few years back, Wizards of the Coast released Duels of the Planeswalkers, a great videogame version of Magic available for consoles. Aside from being fun, that game serves as an excellent tutorial for learning to play Magic and has been phenomenal for bringing new players to that game. 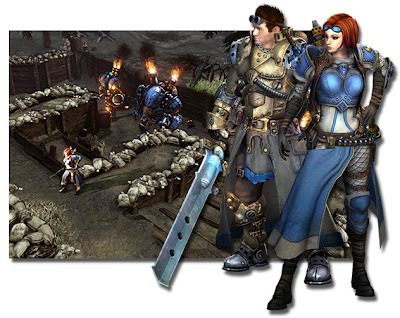 Do you anticipate Warmachine: Tactics having a similar role? Matt: WARMACHINE: Tactics will be a great way to introduce people to the ideas of the game and the setting, and we certainly hope it will introduce more people to the hobby of tabletop gaming, but it doesn't function as a tutorial. In the Magic example, you're actually playing the same cards with the same rules in the video game that you are in the physical game. 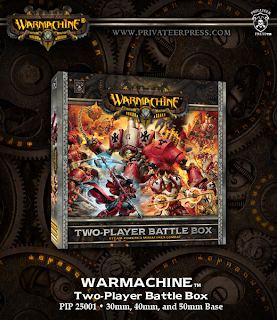 But WARMACHINE: Tactics is somewhat different in scope, and the mechanics that must be understood on the tabletop are largely invisible in the video game experience, so you're not likely to come away from WARMACHINE: Tactics fluent in all of the rules necessary to know in order to play the tabletop game But you will understand the fundamental strategies and the nuance of how different elements in your squad interact and support each other. I do think being good in one would give you some advantage in the other. GUG: Since tabletop Warmachine is not a solo game, we were wondering about the depth of the campaign mode versus multiplayer mode. Do you expect most players to spend more time playing in multiplayer mode, with the campaign being sort of a tutorial? Additionally, will there be an AI for solo play outside of campaign mode? Matt: The single player game is not a tutorial, but it will be a great way to learn the depth and strategy of the game because it does structure your learning experience through the course of the campaign. But the single player campaign is where we get to tell our story, and that's something that both Privateer and WhiteMoon Dreams share — a love of great stories. So making sure we had an amazing campaign experience has always been a requirement of the project. Whether or not more people will play mulitplayer than the campaign, or vice versa, I can't predict. But the multiplayer environment is going to be something that is constantly expanding, so I suspect that always-fresh experience will keep people engaged in multi-player quite a bit. We're not just doing one campaign, though — it's a big world with a lot of characters, so the single player experience will also be something that is constantly fresh. And we are building an arena where you can test your squad builds against an AI, for sure. GUG: Sounds great! Will we see our favorite Warmachine warcasters in campaign mode? Matt: There are dozens of warcasters in the setting, so whether or not you see your favorite featured immediately remains to be seen! But the ultimate goal is to realize as much of the setting as possible in this game. And the better we do with our Kickstarter campaign, the more we'll be able to get in there. 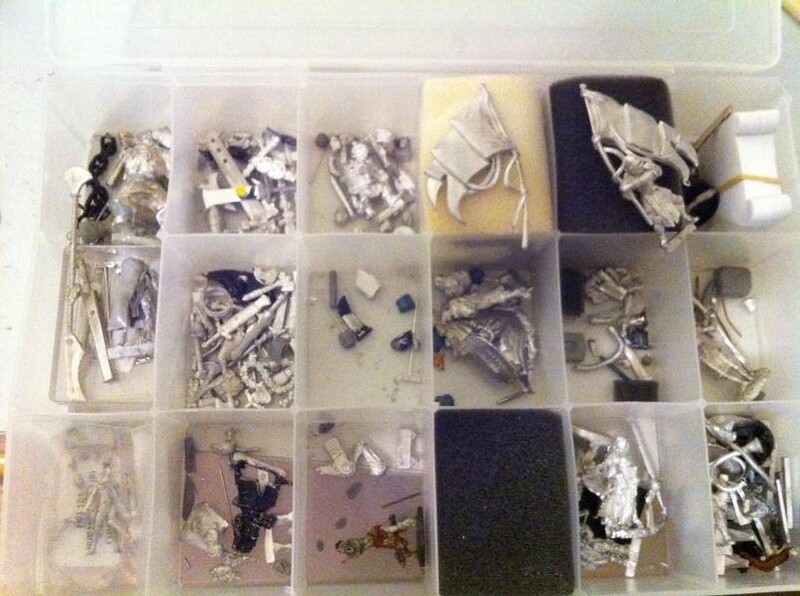 GUG: Many of the fans of Warmachine are miniature hobbyists (myself included!) and would say that some of the fun of the game is painting models to bring to the table. 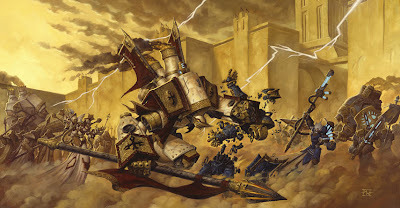 Will there be a nod to the creative types, perhaps the option to "paint" warjacks and units with customized colors, or choose alternate color schemes? Matt: All I can say right now is that we're hobbyists, too, so this isn't something we have overlooked. Okay, I'll also say, "Stretch Goal". GUG: Thanks for that tidbit! Where in the Warmachine timeline does this take place, or is it outside that timeline? Prime starts in 604 A.R., and Colossals takes us to 608 A.R. Matt: The campaign is going to feature characters that are new to WARMACHINE, some of them introduced in next year's expansion book, Vengeance. As such, the timeline is concurrent with the timeline in the story found in the game books. GUG: In terms of the collaboration and division of labor between WhiteMoon Dreams and Privateer Press, how involved has Privateer been in the development, and what level of freedom has been afforded to WhiteMoon Dreams to make their mark on Warmachine: Tactics? What has been done to ensure the game feels like Western Immoren, the world of Warmachine? Matt: The level of collaboration between Privateer and WhiteMoon Dreams is huge and will have a huge effect on the outcome of the game. I'm personally part of the core gameplay design team. I'm also storyboarding character animations and cinematics and I'm leading the writing on the campaign story. In doing all of that, I'm also drawing on the resources at Privateer, like Jason Soles and DC in development, and Doug Seacat, our lead writer, who can assist with making sure the story and game are as faithful to the tabletop game as possible. But there's no real give-and-take here, like one might expect, because WhiteMoon Dreams is 100% invested in making a game that looks and feels as true to WARMACHINE as it can. We're so totally aligned in our goals, and I spend so much time with both companies now, it often feels to me like one giant organization. Even moreso as we've been developing these new characters for both the tabletop game and video game. We've got rules being developed at Privateer that are getting interpreted into the video game at WhiteMoon Dreams, and we've got artwork being created at WhiteMoon Dreams that will appear in our books and that our sculptors are using to create miniatures for the tabletop. It's an incredible level of synergy to see happening between two distinct companies and the end result is that we're going to bring WARMACHINE to life in video game form. It's one of the most exciting things I've ever been a part of.